Ruggedisedcomputers can be easily used in a harsh working environment and extreme temperature. In fact, these types of devices are being utilised in military operations. This is because it is designed to be more durable to withstand rough handling and severe wear-and-tear. But,whilst it is true that these computing systems may work effectively, maintaining a military operation is also tough. With its high level of military applications, panel PCs can be more efficient with the right peripheral devices. And, one of which is integrating an industrial-grade keyboard. 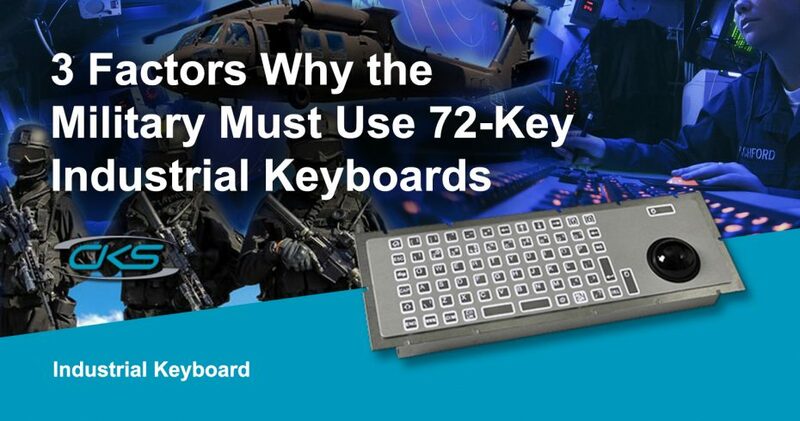 An excellent peripheral solution for military computing systems is the 72-key illuminated industrial keyboard withtrackerball. Its LED backlighting feature allows readability even under tough ambient conditions. So,expect that this keyboard can perform its functions properly in military operations. But, why should the military industry take advantage of this type of industrial keyboard for a military setup? Good questionbecause this blog will showcase its varying features which make it suitable for different military operation. Technology is really gaining a momentum in the military industry. Majority of its departments are making use of industrial PCs to ensure well-functioned processes. Not only that, it also improves the efficiency of operations to streamline communication and information flow. But, upgrading these PCs with remarkable peripheral solutions can also further increases the advantages of having these systems.Say,an embedded computer that is equipped with a72-key ruggedised keyboardcan help enhance any military application.So, it creates an ergonomic typing feedback and navigation system due to the integrated pointing device.Also, with its multiple interface options, it can be compatible with many standardisedcomputer enclosures. Dispensing of information is highly critical for efficient military operations so it is essential to accurately encode data. But, panel PCs can be equipped with a 72-key industrial keyboard which bears a mechanical switch technology. This means that a key only needs to be pressed halfway for it to register. With its distinct, mechanical feedback, it requires less effortof whichuserscan identifyright away if a key has been pressed successfully. Situations requiring a speedy response arealso commonplace in the military.So, it is crucial that programs can benavigatedeasily and accurately for swift task execution. Fortunately,theintegratedtrackerballofthe rugged 72-key keyboard features 200 pulses/ball revolutions.Hence, military personnel can easily conduct various field tasksbecause this device offersaccuracy and efficiency. Typically, any equipment used in the military should be easy to configure and setup.That is why ourruggedisedkeyboards offermultiple placement options: cased, bezel, rear or flush mount.Therefore,itwill beconvenient to install in different military operations – whether in the command centre or onboard military vehicle setup.Likewise, operativescan also utilise the device even in a varying environment. But, toachieve these pre-requisites, operatives must use toughandrobust computing systems. However, in an ever-changing field, it isalso essentialto further upgrade computing technologies to get the most advantage.A great monitoringsolutioncould beembedded PCs equipped with the 72-key industrial keyboard to improve the execution of military tasks. Call anIC manufacturertodayandstart upgradingits peripheral devicesfor military usage.